It stings a little, deep down, when I have to admit that it hurts to dry my hair. It’s not a yelping pain or a whimpering pain, just a constant, low-level annoyance. At first, when I’m giving the ‘do the initial all-over heat blast, there’s just general arm fatigue. Then, when I get down to the nitty gritty, with the brush twirling, my hands start to cramp–first my wrists, then my fingers. Despite all the formal medical indications of lupus, having trouble with the hairdryer is, for me, the single most dependable symptom. It does make me feel a bit better to hit the farmers’ market around the Ides of March, where you can’t walk two stalls without tripping over some poor sprout of a vegetable who’s clearly had a rough week also. Take stinging nettles, which are sold in half-pound plastic bags all spring at Seattle-area markets. They were just napping on a wet hillside somewhere, so innocently, when someone came and snipped them out of the ground, probably cursing at them. Nettles aren’t like tomatoes or apples; no one ever wants to touch them. People just stare and point, and then, in most cases, walk right by. 1.They’re really easy to cook. I like to think of the taste of nettles as somewhere between mint and spinach. They have a fabulous affinity for pestos, so every year, usually when I start getting cranky about the weather, I make a pesto with whatever nut and herb combination happens to inspire me at the moment. This week, I went for tradition, with a hint of lemon. They’re weeds. They’re wild. They sting. But like anything worth eating, they have a definite season. And since my complaints generally line up pretty well with their growing season, it’s often quite nice to focus equal attention on their appearance and disappearance. I have an anti-lupus music compilation on my computer called “A Mix for Sunnier Times.” It’s a cacophonous mismatch of tunes, everything from Scooter Lee to Bill Withers to ZZ Top. Every song has to do with the sun. (This is a little ironic, because lupus is exacerbated by sun exposure.) I forget about it every year, only to rediscover it in March. And every time I sit down, feeling blah, and hear the synthesizer notes alternating between earphones as I Wear My Sunglasses at Night starts blasting, I feel a little brighter. After all, nothing lasts forever. Stinging nettles are delicious edible weeds with a layer of prickly hairs on the sunny side of each leaf. They will sting if you touch them raw—but cooking them denatures the sting, rendering them perfect fodder for a springtime pesto. Add chopped grilled chicken, if you’re looking for a bit more heft. 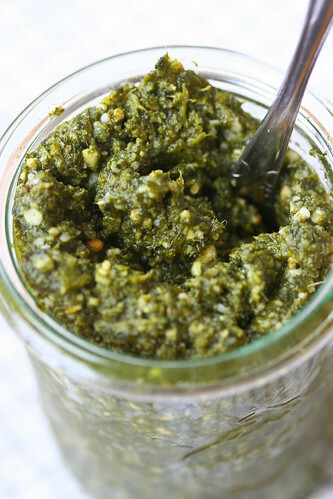 Whirl the nettles, garlic, pine nuts, salt, lemon zest, and lemon juice in a food processor until smooth. With the machine on, add the oil in a slow, steady stream, whirling until combined. Pulse in the cheese, then season to taste. Set aside. Cook the pasta until al dente, according to package directions, adding the peas to the cooking water about 3 minutes before the pasta is done. Reserve a cupful of the cooking water. 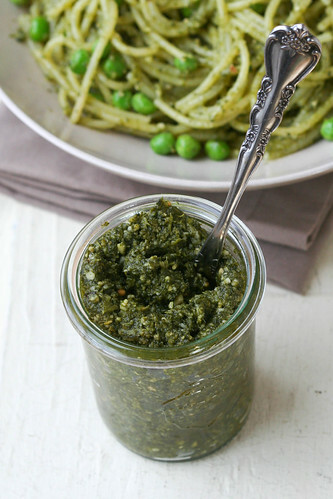 Strain the peas and pasta, then return them to the pot, along with 1/2 cup of the pesto and about 1/4 cup of the cooking water (you may need more or less, depending on how loose you like your pasta sauce). Serve immediately, sprinkled with additional cheese. Jess, this is just so well written, so very well written. Thanks for making my day. Jess, just wanted to thank you for your post. What beautiful insights and amazing recipe. I added toasted walnuts instead of pinenuts to find a deliciously earthy taste.. thanks again. I just tried this one. I’m definitely not going to buy ready pesto ever again.